For example, when an Israeli soldier dropped a big brick on Idmon’s head (who was 17 years old) killing him instantly, the Israeli media said that a wall collapsed and caused Idmon’s death. Idmon was a family relative from my town, and after his death, in 1987, Israeli soldiers imposed a military curfew on my town. The soldier who killed Idmon suffered no consequences. On my way to my grandparents’ house, I personally was shot at by an Israeli woman when I was 14 years old. I survived because I ran and hid behind a wall. Had I died, no one would have been held accountable. Why? Because Palestinians live in the State of Israel, but we are NOT Israeli. We are not citizens there and therefore have no rights! I grew up in a depressing situation and wanted to die. In fact, I stood still in the line of fire hoping an Israeli bullet would end my misery. Many Palestinians these days feel the way I felt as a teenager. Mostly because they lost everything, their land, their rights, and their identity. To help Americans understand what happened to my country, let me relate it to their lives. As there seems to be some out there who really don’t understand the truth until they live it. 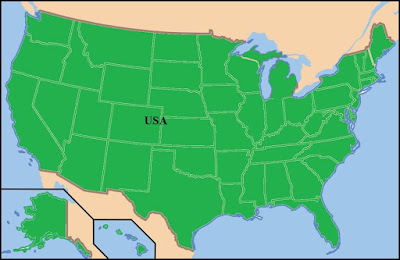 Suppose that one day Russia decides to occupy half of the USA. Sorry for choosing Russia, it is just for illustration. 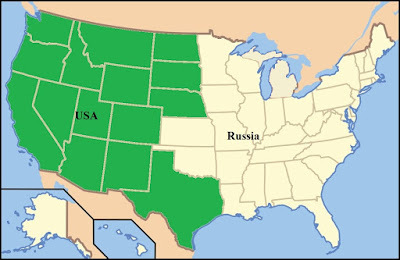 Russia occupies all the Eastern side of the US. Half of those who live in the Eastern side flee the country and become refugees and half of them, including you, move to the west. You were among those refugees who had to leave their homes and move west. In fact, they killed your father and told you that if you don’t leave, they would kill you too. You were forced to leave your home, land, work and everything you owned and make the trek west. You live in a refugee camp in Idaho for a few years and start to settle there. 19 years later, Russia decides to occupy the rest of the United States. Now you live in the country of Russia and the USA does not exist on maps. There is no America. Your passport is not valid, your nationality is not valid. When you try to raise your American flag, the Russian soldiers make you take it down and burn it. During that war to occupy the west, you are again forced to leave your home in Idaho. They actually make all the population of Idaho (about 2 million people) leave and you all settle in Salt Lake city. Notice that means that there are now about 20,000 people per square mile living in Salt Lake City. (this is if we assume for the sake of argument that SLC was empty to begin with). Here is the new map of your country. 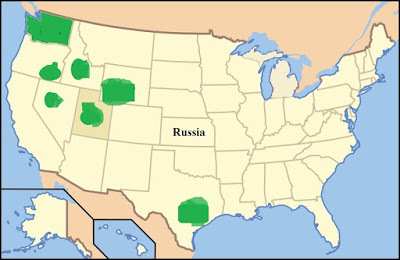 Aside from a few Americans that managed to stay in Russian areas, the rest of the Americans are forced to leave or live only on the green areas. As for the city that you now live in, they block all exits out of Salt Lake, build fences in certain areas and walls in others and place checkpoints all around the city. You are not allowed to leave Salt Lake City and no one is allowed in. You were separated from some family members and you don’t know where they ended up. Sadly, there are no water sources in Salt Lake city and so 90% of the water available is not clean. Electricity is hard to obtain, and so you only have electricity half of the day. Now some rebels who are living in your town build some home-made missiles and start firing them at Russians outside SLC. In response to that, Russian F-16 plans go in the air and bomb your city. 60,000 homes are damaged (20,000 completely destroyed). Hundreds of thousands are left homeless. Sadly, you can’t rebuild homes in Salt Lake City because you run out of supplies and nothing is allowed into the city because of the closure Russia has imposed. Because of the rockets those Americans in your town fire, your people are labeled as terrorists. The whole world sees Americans as terrorists. So, other countries in Europe start funding Russia and giving them weapons so they would fight against you and protect themselves. Now, luckily for you, it didn’t happen to your country. It happened to mine. Half of my people live in the State of Israel (the rest are refugees in various areas of the world). We live in Israel, but we are not Israeli. What I mention about Salt Lake City is exactly what happened to Gaza. Gaza is a city of 2 million people who are not allowed to leave and who live in poverty. Refugees constitute 75% of the population of Gaza. Their lives matter! Because there is no international law that allows you to hold 2 million people hostage in those situations and expect them to do nothing to liberate themselves. Notice, I am not trying in any way to justify any terrorism. And I am not claiming that Palestinians have done nothing wrong. I am against killing innocent civilians whether they be Israeli or Palestinian. I think Palestinians should stop firing rockets at Israel. My dear friend Daphna is Israeli and her family lives close to where those rockets are landing. I don’t want to see her family, or any innocent Israeli, get hurt. But, I also think there is a solution other than bombing innocent civilians in Gaza to respond to the rocket attacks. I have seen many images of Palestinian children being dug out of the rubles of homes in Gaza or those that are burned alive or those that are bombed to pieces. I would not like to include such images here, but all you need to do is google those images if you want to be horrified. I think we need to step up and not let what we hear on the media dictate what we think. There are always two sides to any story. If you hear only one side, you will be tempted to think a certain group or nation is ‘bad’ and another is ‘good’. An example of that is what the media in the US is trying to do to make people think Muslims are bad. If you think Muslims are ‘bad’ even if you don’t know any Muslims, then you are a victim of the media. If you think Palestinians are ‘bad’ even if you don’t know any Palestinians, then you are a victim of the media. We are all brothers and sisters. Why do we let the media dictate what we think or how we feel about each other. Let us forgive and love one another. All human lives should matter to us. The solution to the Palestinian/Israeli problem is not violence. It is love, forgiveness and equality. When we advance to seeing all people as children we of God, equal in His sight and beloved of Him, then we can start to break down the barriers and establish peace.